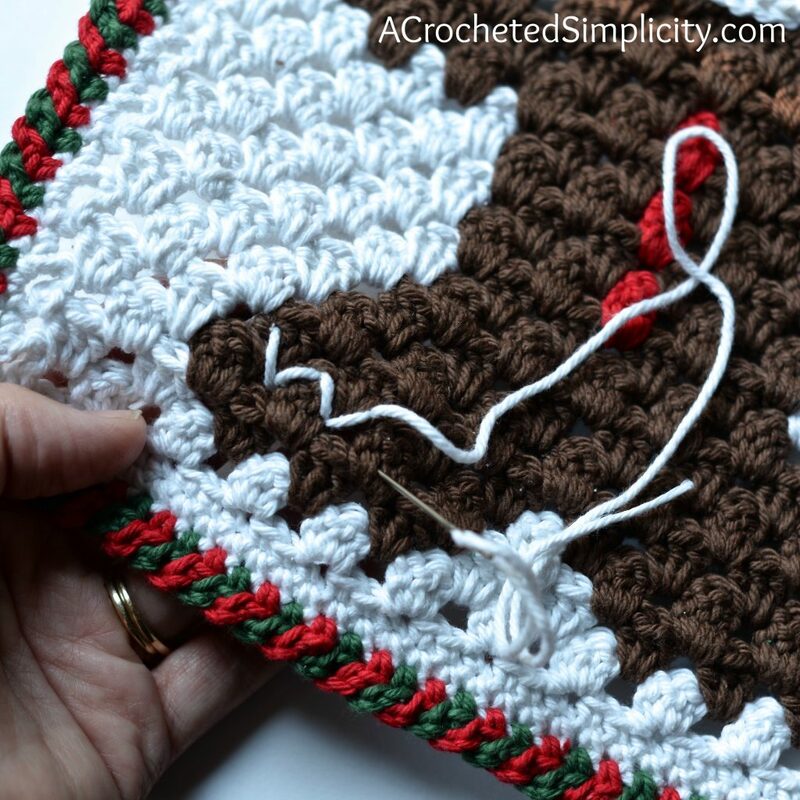 Last year I released my Retro Christmas Tree Towel and it was the first free granny stitch intarsia design I added to my blog. 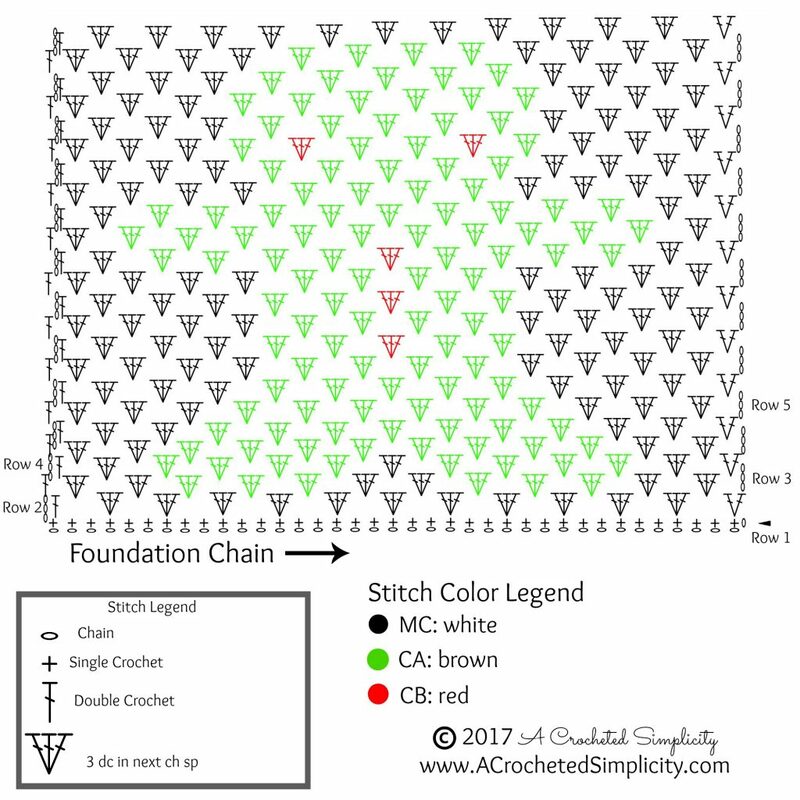 Since then I released a couple others, if you enjoy the technique you can see them here: Free Crochet Patterns. 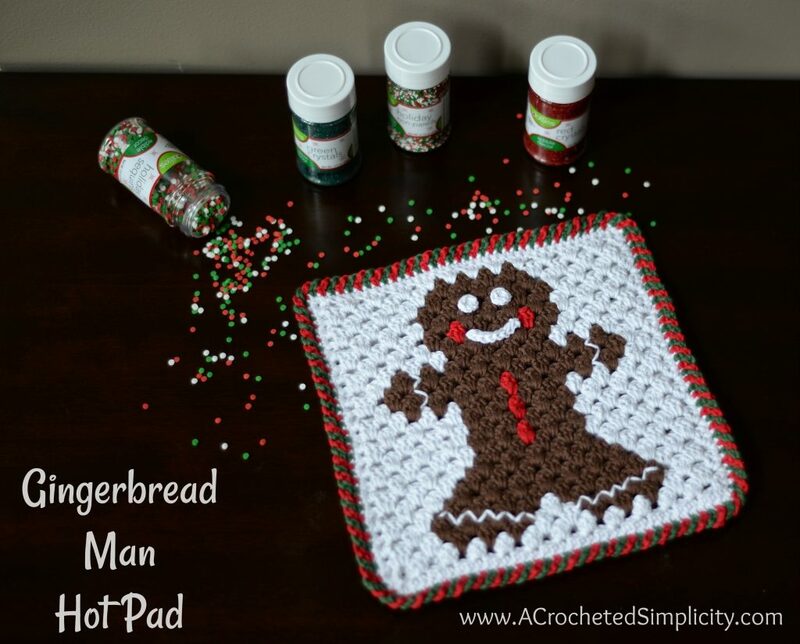 The Gingerbread Man Hot Pad is fun to work up and makes a great gift for family and friends, or a great decoration for your home. 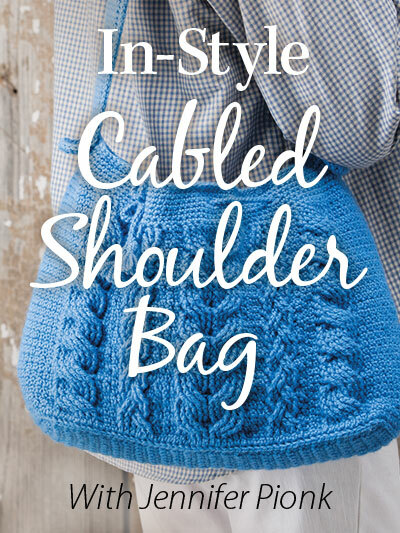 I used 100% cotton yarn for mine. You can use other yarns, but be careful with acrylics if you plan to actually use your hot pad as they can melt. *You can choose to make a solid white panel for the 2nd motif, back of the hot pad. 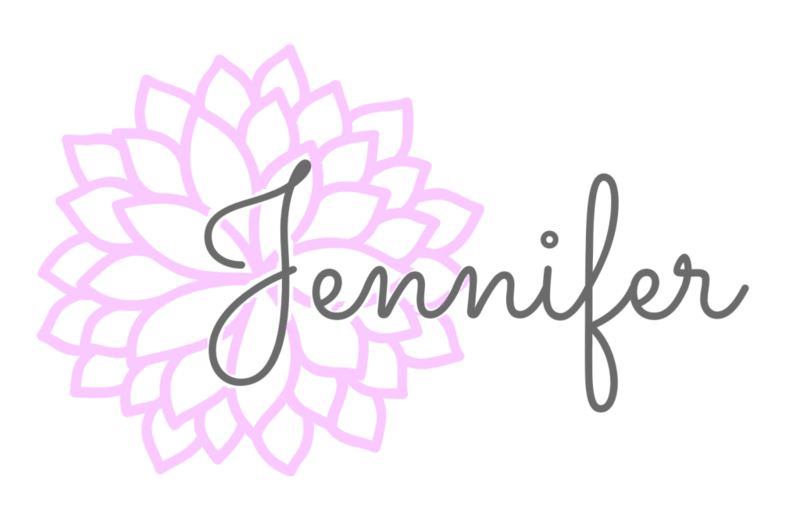 Just be sure to check your gauge as you work as sometimes when working color work your gauge can vary. Rows 5 – 24: Rep Rows 3 – 4. Fasten off first motif. Make the second motif, but do not fasten off. Place a SM in the last stitch of the 2nd motif to hold the yarn. Continue below to Smile. Fasten off. 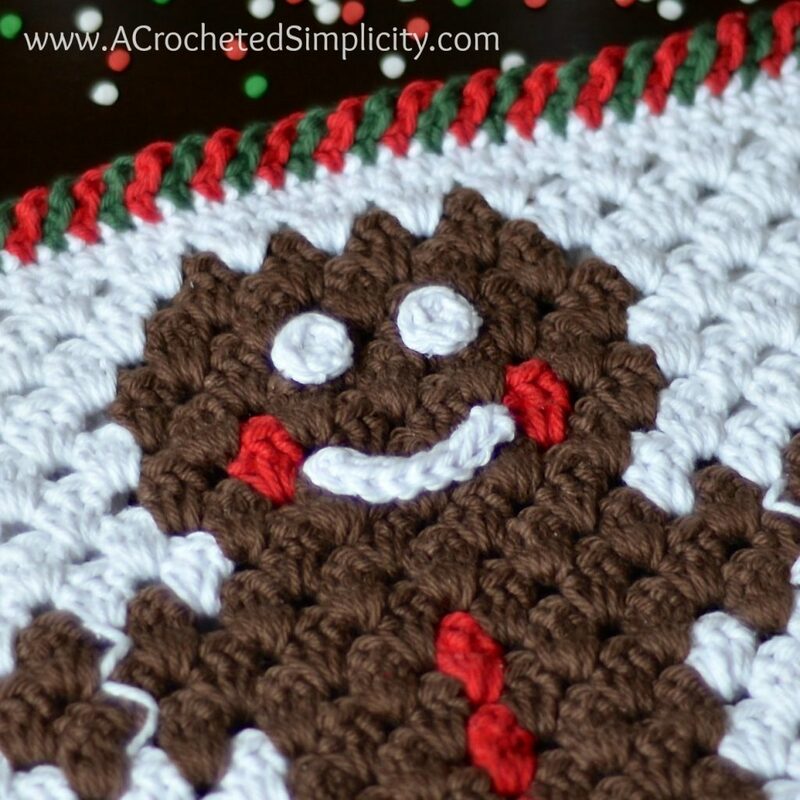 Use a yarn needle to attach the smile to the gingerbread man’s face as shown in the photo above. Continue on to Eyes. Fasten off leaving a 6″ tail for sewing. 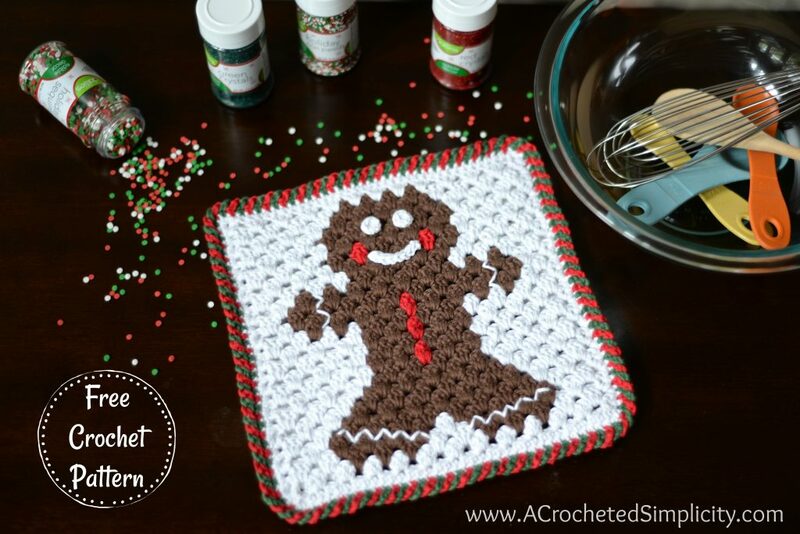 Using a yarn needle, attach the eyes to the face of the gingerbread man as shown in the photo above. Continue on to Ric Rac Trim. 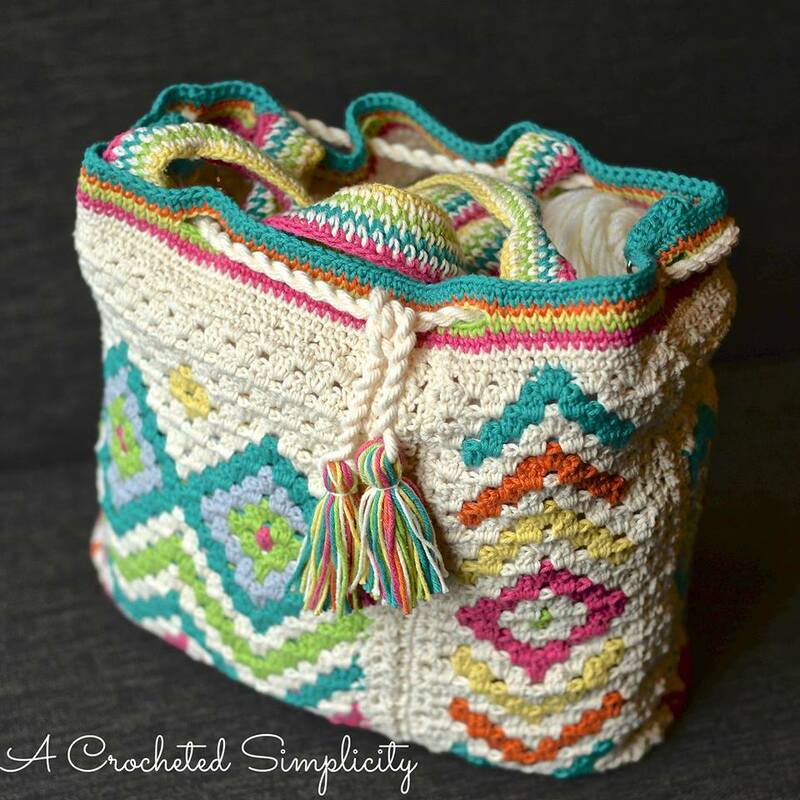 For each arm and leg, use a 12″ piece of yarn and a yarn needle to sew decorative ric rac on like the photos. See photo above for close-up. Weave in ends. Continue below to Joining Motifs & Preparing Hot Pad for Border. In this round you will join the 2 motifs together while at the same time, prepare the edges for the rnd of decorative edging. Line up the last row of the motifs with RS facing out. Place a SM at each corner to help hold the motifs in place while you work. Work your stitches of this round through both motifs. Fasten off. Weave in ends. Continue on to Criss-Cross Edging. The criss cross edging is worked by alternating 2 colors as you work around the perimeter of the hot pad. 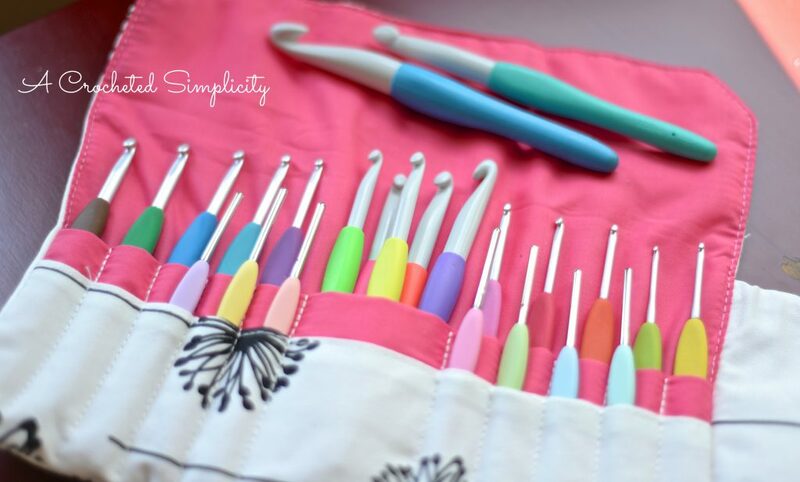 If you’ve never worked a similar edging, click here to see the photo tutorial. Step 1 (RS): Join CB w/ a sc (click here for tutorial) in any st along the bottom edge of the hot pad, ch 3, pull up on the loop on your hook to increase it, remove hook from CB. Step 2: Join CC w/ a sc in the st to the left of where you joined CB, ch 3, pull up on the loop on your hook to increase it, remove hook from CC. Step 3: Insert your hook back into the CB loop from step 1, tighten the loop back up on your hook, working in front of the CC yarn from step 2, skip over the CC sc and sc in the next st, ch 3, pull up on the loop on your hook to increase it, remove hook from CB. Step 4: Insert your hook back into the CC loop from step 2, tighten the loop back up on your hook, working in front of the CB yarn from step 3, skip over the CB sc and sc in the next st, ch 3, pull up on the loop on your hook to increase it, remove hook from CC. Repeat Steps 3 & 4 around the perimeter of your hot pad and end with a ch 3 of each color. Fasten off CB & CC. Using a yarn needle, weave the tail of CB in through the beginning CB sc. Weave in ends to secure. Then use the yarn needle to weave the tail of CC in through the beginning CC sc. Weave in ends to secure. That’s it! Now he’s ready to adorn your table during the holidays!